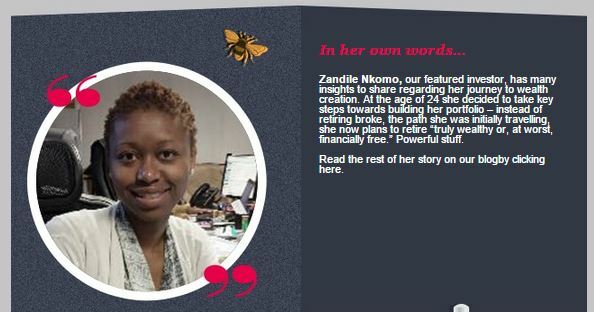 Just to give you a little background about me: My name is Zandile Nkomo. I have a BCom in economics from the University of Pretoria, which we fondly call Tuks. I am currently employed as a sales consultant at a financial services company.Even though my degree involved the study of financial markets – and I work for a financial service company! – I was not really motivated to invest. In fact, the idea of investing for myself was far from my mind. It seemed to me like that’s what the rich do to get richer. It did not occur to me that it’s actually what the poor need to do to get rich! Just after I started working in my current job I attended the Gigabucks course hosted by Tom de Lange of Purple Group, which is the holding company for EasyEquities. As part of the course we had to calculate our wealth index. I AM 24 YEARS OLD!! What wealth Index???... yes! Apparently I have a wealth index (although “no index” was more like it in my case). It was then that I realised that at the rate I was going, I was would be forced to retire broke unless I came up with a new plan of action … PRONTO! My first move was start an investment in the Robert Falcon Scott fund through Emperor Asset Management. I chose this fund because, at the time, it had yielded an average 24% return to date. With EasyEquities I can manage my own portfolio of shares and actually own the shares. I’m currently working on the third move which will be to diversify my investment portfolio. Equities are great and all, but the rule of thumb to investing is you cannot have all your eggs in one basket. I’m proud to say my wealth index is looking up and at this rate I intend on retiring truly wealthy or, at worst, financially free.